Table Percentage % – Average table size relative to the average diameter, reported to the nearest whole percentage point (1%). Table size is measured from bezel to bezel point; the average of four measurements is used. The size of the table is in adverse proportion to the crown facets. The larger the table, the smaller the crown facets. Likewise, the smaller the table, the larger the crown facets. The dispersion of light in the diamond is derived primarily from the crown facets. The brilliance is caused by the light that goes in from the crown and then is reflected by the bottom facets. The table size must be within a proper range. Ideal table size range between 53% and 61%, when well matched by the bottom angle, produces the best results. Diamonds with larger tables 62% – 65% and higher have a bigger “spread” meaning they look larger than the carat weight indicates and can be brighter returning more light, but are often less fiery than diamonds with smaller tables. They have less scintillation. 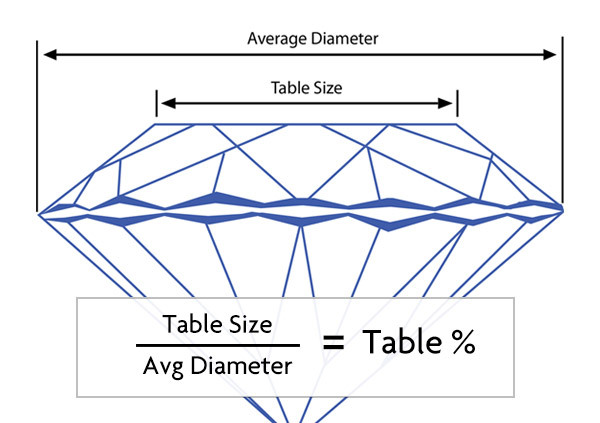 Diamonds with small tables 50% – 53% look small or underweight as more carat weight is required to produce a small table. Smaller tables produce more scintillation and less brightness. Brilliance represents the way the diamond reflects the light. This is determined by two components: brightness and contrast. A diamond is considered to have a high brilliance if it returns a large amount of bright light from the top or “face-up” perspective. If a diamond is cut too deep or too shallow, this may allow light to escape, which will affect the stone’s brilliance and is considered inferior in quality. Contrast is the way the light appears when it is reflected in the diamond. If you look at a black and white checkered piece of paper next to a plain white piece of paper, the checkered paper looks brighter than the white paper, even though they actually have the same brightness. This is due to the principle of contrast. The same is true with diamonds, if all facets of a diamond reflected light equally, it wouldn’t look as bright as when light is reflected in a pattern of key areas with contrasting backgrounds. Dispersion and fire equal scintillation. Scintillation is the fire of a gemstone displaying spectrum of colors caused by its reflecting white light before returning it to the eye. Scintillation or amount of sparkle which is the intensity and frequency of flashes of white and colored light. A diamond that has a smaller table and a steep crown angle will produce large amounts of fire; however this will lower the amount of light and brilliance. The amount of scintillation is directly affected by the Crown angle which in turn is affected by table size. Generally it is most prudent to request a Table Percent of 54% – 60%. This number places the diamond in the middle of the best percentage range of the “Ideal CUT”.